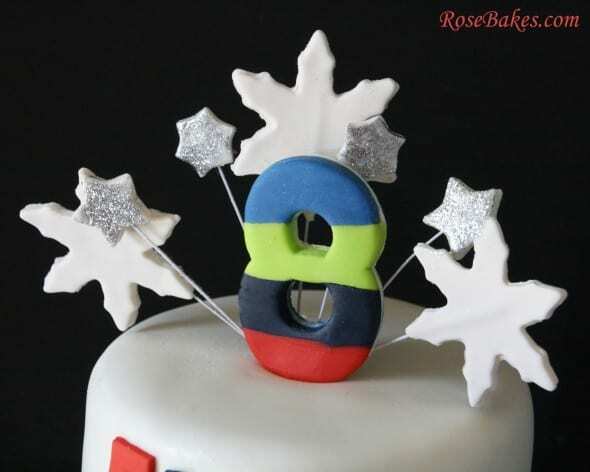 Today I want to share with you a Winter Snowflake Birthday Cake. 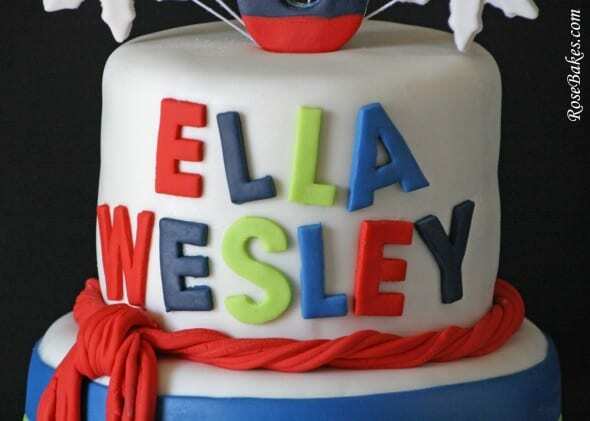 Before I do that, do you remember Ella Wesley’s Holly Jolly Christmas Candy Cake from last year? If you’ve been hanging around Rose Bakes for very long at all, I’m sure you do! 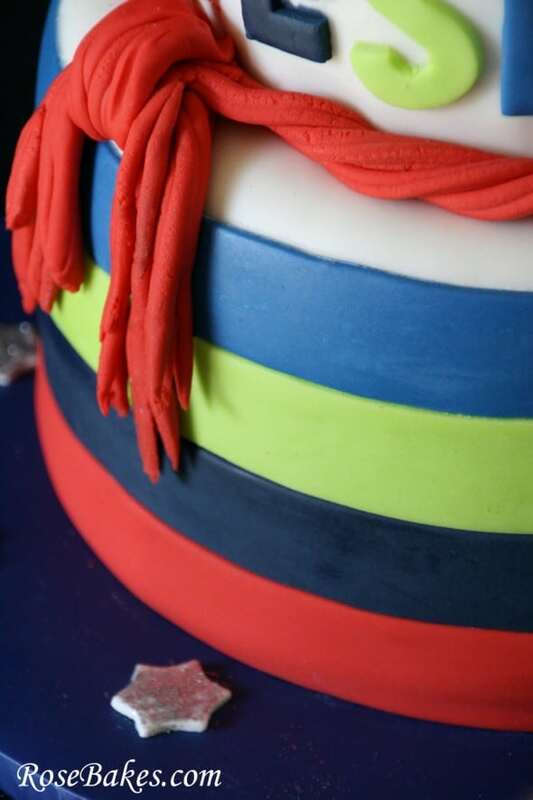 If you like Christmas cakes, be sure to have a peek at it too! 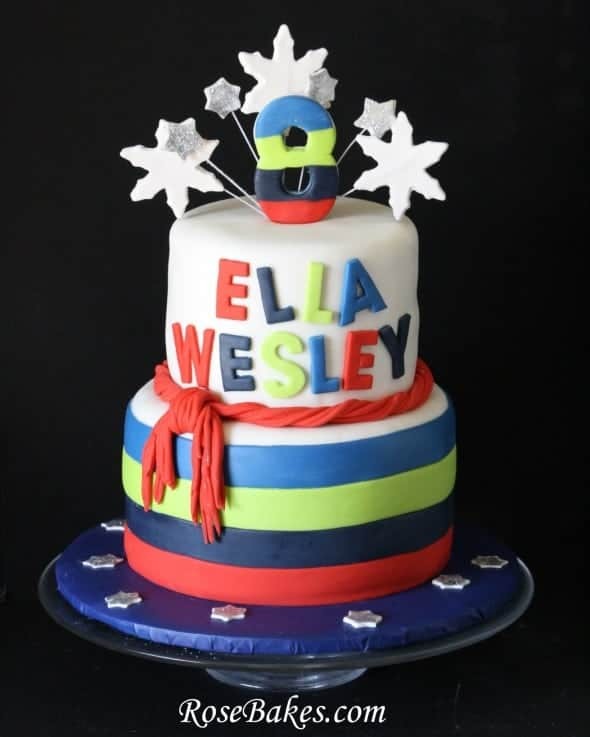 This year for Ella Wesley’s 8th birthday, she was going to celebrate with her closest friends by going out ice skating, then to eat, then having hot cocoa and cake and a visit with Santa! 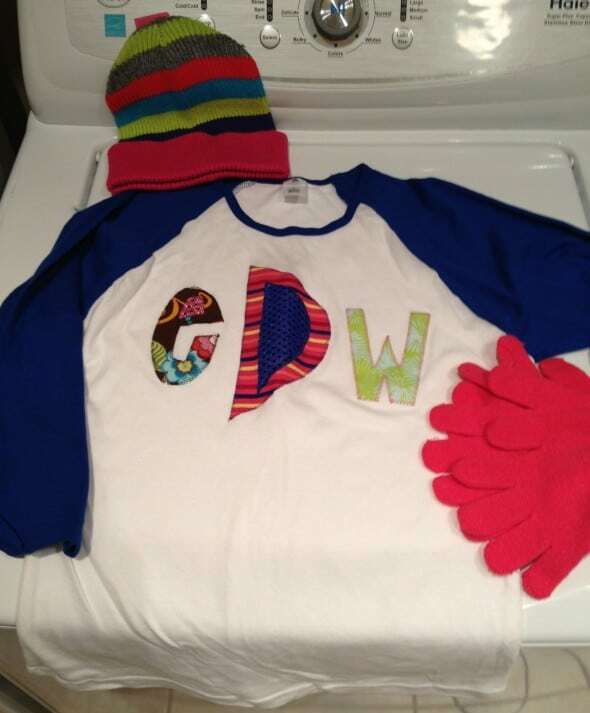 For this fun night out, all of her friends were getting custom shirts, hats and gloves for their trip ice skating, so I used those colors and design as an inspiration for the cake! 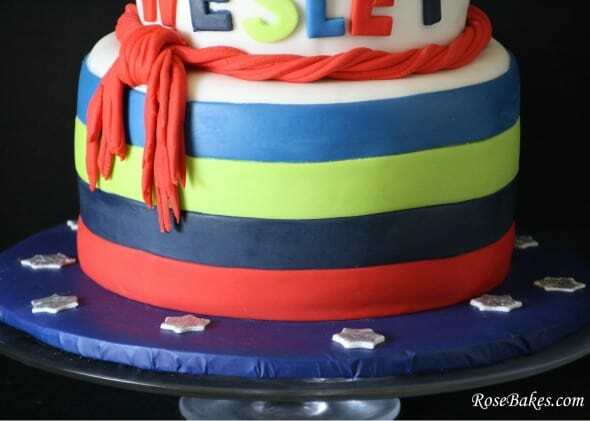 The bottom tier was horizontal stripes in bold and fun colors from the hat – I’ve always seen and loved horizontal stripes on a cake and I thought this was such a neat effect! I cut the stripes using my FMM Multi Ribbon Cutter wheel… love that tool!! For the top tier, I thought I’d keep in step with the colors, but alternating them and making them wonky to add a little more fun! I used 1.5″ alphabet cookie cutters to do the letters. Although there wasn’t specifically a scarf in the girls outfits, I thought it making a scarf-like border would be unique and tie right into the theme (no pun intended ;)). I used my extruder to make the long strands of red fondant. 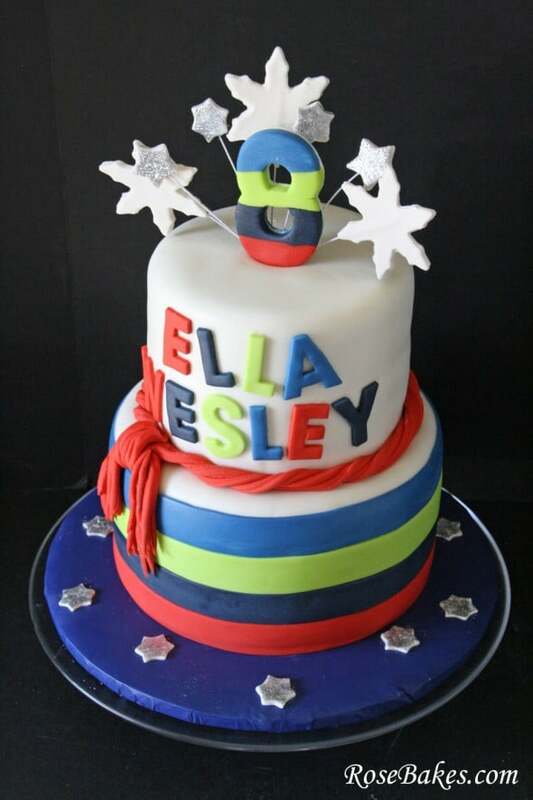 For the topper, I wanted to do something different with the number, so I made a gum paste “8” cut with a larger Wilton number cutter (from this set). Then I cut coordinating stripes with my ribbon cutter and glued them on. To make the top really shine, I added snowflakes and disco dust covered stars on wires! I used gum paste for both. You can check out my tutorial for how to put stars on wires here. For the board, it was covered in a disposable plastic navy blue table cloth and put some sparkly stars on there too! Side note… that is one of my favorite ways to add color to a board that is inexpensive, easy to find, and comes in a multitude of colors! Just add parchment paper or a cake round in-between the cake and paper to keep it food-safe and to keep it from sliding… I usually use a cake cardboard round and put a piece of duct tape doubled over between the tablecloth and the cake round! This cake was all vanilla cake with vanilla buttercream. It was covered and decorated with Homemade Marshmallow Fondant except where I mentioned I used Satin Ice Red vanilla, Satin Ice Blue fondant, and Satin Ice gum paste.